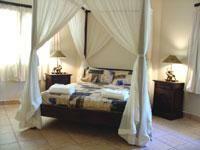 Welcome to Hippo Hideaway situated on the banks of the St. Lucia Estuary near the Greater St. Lucia Wetland Park and Hluhluwe-iMfolozi Game Reserve. This idyllic luxury Lodge is your gateway to the unspoiled Beaches and Game Viewing of the Elephant Coast in the KwaZulu-Natal region of South Africa. Consisting of 20 luxury air conditioned Suites on either a Self Catering or bed & breakfast basis, Hippo Hideaway is a luxury ethnic retreat like no other in KwaZulu-Natal. 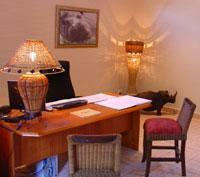 The Lodge comprises 20 luxury air conditioned rooms each with its own fully self contained kitchen. Breakfasts are an optional extra and can be specified when making your reservation. 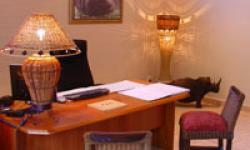 Flatscreen TVs in all rooms give access to DSTV for those rare days of rain in the area. There are 7 two sleeper units, 12 four sleeper units and 1 honeymoon suite. 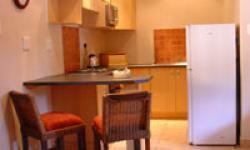 All units are totally self contained with luxuriously appointed kitchens. 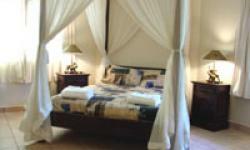 All rooms are fully air-conditioned with luxury fittings and decorated with a true ethnic style. 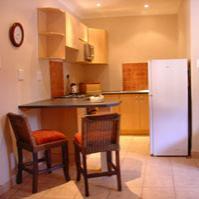 Rooms are provided with DSTV, Tea and Coffee, Toiletries, Bed Linen & Towels supplied, Microwave Oven, Fridge/Freezer. As well as comfortable luxury rooms the resort also offers a large furnished and thatched lapa which looks out over the Lodges crystal clear Swimming pool. A lovely wooden sun deck, with a view over the Lodges gardens, offers the perfect environment for a relaxing day or evening sundowners. Hippo Hideaway is situated on the banks of the St. Lucia estuary and is often blessed with the presence of a variety of wildlife coming up to graze in the early morning sun. Bird life is abundant in the area and Hippo Hideaway is proud to be awarded 'Birder Friendly' status by Birdlife South Africa.